From the Benchmark Wilderness Ranch it was a three day hike on the Continental Divide Trail through the Scapegoat Wilderness to Rodgers Pass near the small town of Lincoln, MT. I had the Benchmark Ranch all to myself (except for the owner and about 25 horses and mules). My resupply package was waiting for me, I pitched my tent, and enjoyed my first hot shower in six days. When I departed the ranch, a sign at the trailhead discusses the 1988 lightning caused Canyon Creek Fire which burned 247,600 acres and became the largest forest fire in Montana since 1910. The fire burned about half of the Scapegoat Wilderness that I was about to hike through. True to the sign, much of the Scapegoat had burned. Some burn areas looked more recent than 1988, while other were probably from the Canyon Creek Fire. 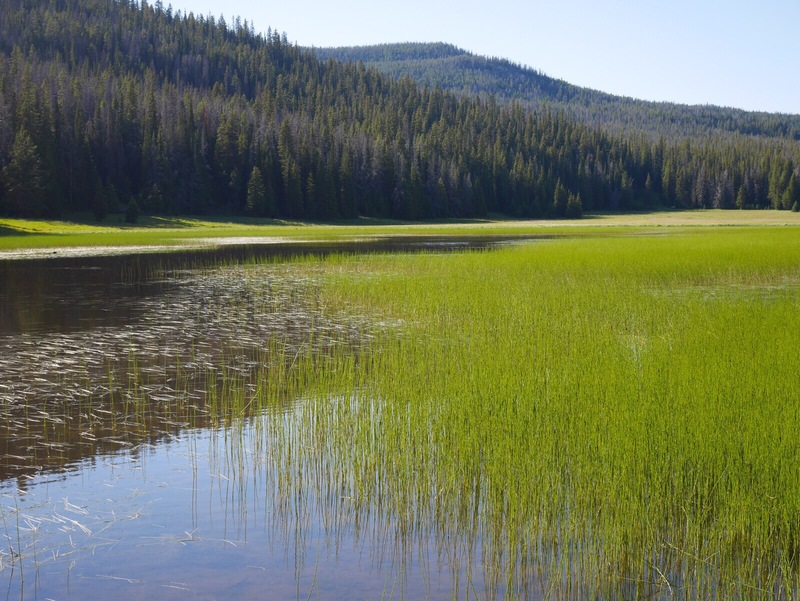 In many areas you could see small Lodgepole Pines regrowing. It was both encouraging to see the forest coming back, but at the same time it’s been almost 30 years and the small size of the new trees is a reminder of just how long the recovery will take. The final day of the hike was a spectacular ridge walk along the great Continental Divide. Skirting Caribou Peak and then following ridges connecting Red Mountain and Green Mountain to Rodgers Pass the views were windy but spectacular. Currently I’m taking a zero day in the pleasant little town of Lincoln, MT. It has several motels and restaurants and a small but good grocery store. Tomorrow I depart for the four day hike to Helena. Trivia: Ted Kaczynski (AKA the Unabomber) lived near Lincoln until his arrest in 1996. The Chinese Wall in the Bob Marshall Wilderness. The Bob is the Bob Marshall Wilderness that begins about 30 miles south of Glacier National Park. Just to refresh everyone’s memory, since I haven’t had cell service in awhile, I departed East Glacier on the 4th of July. 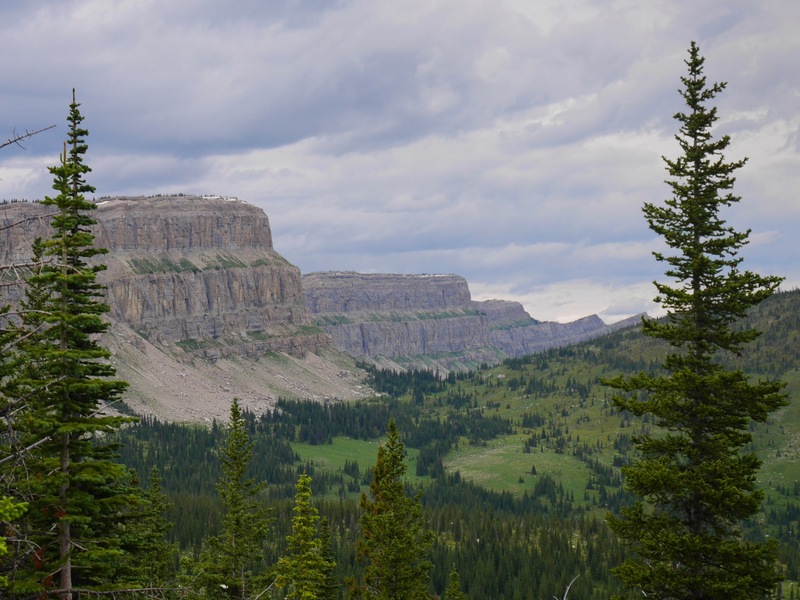 It’s a 16 mile hike on the Continental Divide Trail from East Glacier to the southern boundary of the National Park and I hiked a few miles past that. I have been hiking 20 mile days pretty regularly so it was not difficult to make it past the park boundary were I could legally camp. On the second day the CDT passed through a large wildfire burn area from a few years ago. The problem with burn areas, aside from green trees being much prettier than dead burned trees, is that the burned trees often fall down blocking the trail. It was slow going in a few places because of the downed trees. The Chinese Wall was the highlight of The Bob. Named because of the similarity to The Great Wall of China, it was quite spectacular and it was fun to spend the day walking along it. Unfortunately for my photos it was overcast skys. The area is popular with weekend backpackers. I saw around 40 backpackers the final day I walked the wall and into Benchmark Wilderness Ranch, where I had a resupply box waiting. Benchmark is the first road access to the trail since Marias Pass 100 miles and six days ago. I decided to flip up to the Canadian border and walk south on the Continental Divide Trail for awhile. After a pleasant three week break from hiking in Santa Fe, I flew to Spokane and then hopped on an Amtrak train. The train departed about 1 AM and arrived at the small town of East Glacier about 10 AM. It was pleasant ride with large comfortable seats that were easy to sleep in. (I heard that the next day’s train was seven hours late, so it’s best not to make any firm plans for your first day in Glacier). In East Glacier I purchase stove fuel and “Grizzly Tough” bear spray ($48!!). Since you can’t take either on an airplane you have to wait until you arrive to buy these. Then I made my way to the small area known as Saint Mary closer to the Canadian border. Saint Mary has a visitor center where you can get backcountry permits, a campground with $5 hiker/biker campsites, grocery store, restaurants, expensive lodge (one hiker stayed there and said he spent $200 a night for his room!). I shared my campsite with a group of four bicyclists who were riding across the country. Speaking of backcountry permits, they are difficult to get in Glacier National Park. Backpackers are required to camp in established backcountry campsites and each campsite must be reserved when you get your permit, except that almost all the campsites are already taken. CDT hikers are having to do all kinds of crazy things — delaying there hike, doing really short or long days, hike alternate trails, camp in campgrounds, take extra zero days, hike northbound, hike southbound, etc. to find campsites and work through the permit process. I was only able to get a permit for three days of hiking from the Canadian border to Going To The Sun Road because of this. I took the noon GPI shuttle from Saint Mary to Chief Mountain ($30). The shuttle dropped me off at the Chief Mountain border crossing to Canada. I didn’t actually go into Canada, but hiked south from the border and I was off to my first night back on the CDT at Elizabeth Lake. It was an easy 11 miles — I started about 2 PM and arrive in plenty of time for dinner. This was a very pretty day of hiking up to 7,500 foot Redgap Pass then down to the campground at Many Glacier. Apparently there is a shorter route through a tunnel, but it’s has not yet opened for the season and the doors of tunnel are locked. Not sure I can imagine what this looks like, someday I will get up there to see the trail going through a tunnel. 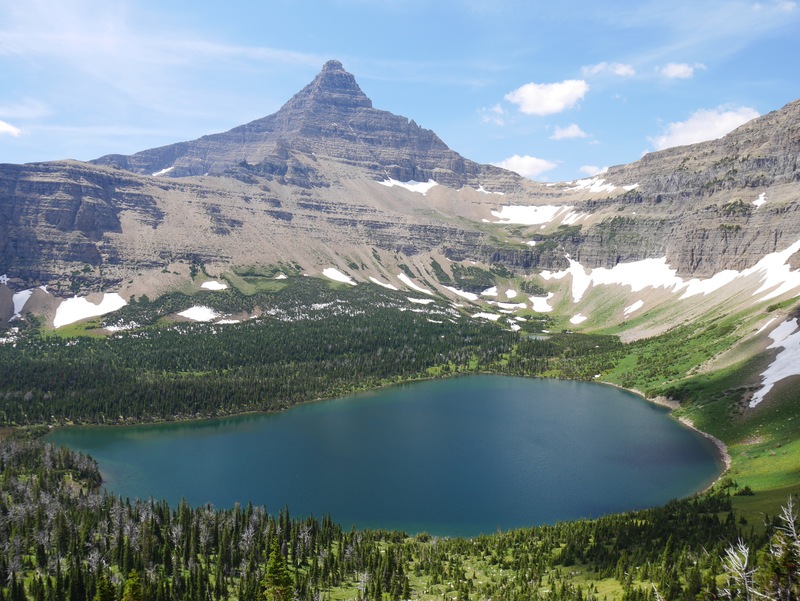 Many Glacier is a hub of tourist activity with several hotels and a busy horse concession. It does have a pretty good (and also very busy) restaurant where I enjoyed dinner with another hiker. Many Glacier marks the point I joined the official Continental Divide Trail. The previous two days I had been hiking the Chief Mountain CDT Alternate because the official CDT was closed due to snow. So far I have encountered almost no snow on any of the trails I have hiked. Before departing Many Glacier I was able to stop by the ranger station and get another backcountry permit for three more days of hiking. It does start at a trailhead in Saint Mary, so I will have to hike about five miles to actually rejoin the CDT. From Many Glacier I hiked up 7,300 foot Piegan Pass and then dropped down to Going To The Sun Road. The hike from the road to the pass is popular with day hikers and I probably saw 40 hikers — far more than I have seen anyplace else in the park. Some hikers from California gave me a ride to Saint Mary campground. This time I had the hiker/biker campsite all to myself. I followed the Red Eagle trail about five miles to rejoin the CDT. The trail runs near Saint Mary Lake but sadly much of it runs through a large burn area from a wildfire in 2015. After rejoining the CDT the trail climbs up to the 7,400 foot triple divide and then along the side of a steep rocky slope above Atlantic Creek. Tiny baby mountain goats looked down at me curiously from the rocky slope above. Today’s hike climbed up to 7,600 foot Pitamakan Pass and then followed Dry Fork Creek to the Two Medicine campground. I saw more hikers in the back country than usual as I got near the Two Medicine Lake area. Fortunately it’s not as busy as the Many Glacier area. I’m sharing my hiker/biker campsite with a bicyclist and four hikers doing short backpacking trips in the park. Today was a short 10 mile hike from the Two Medicine Campground to the community of East Glacier. The Glacier National Park area is pretty busy due to the holiday weekend, but Brownies Hostel allows camping in their shady yard behind the hostel. I have had lunch, showered, done laundry and plan to take a day off from hiking tomorrow.